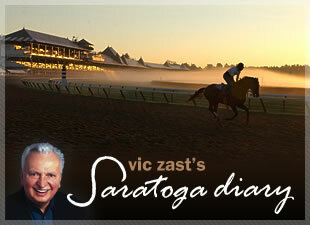 Veteran racegoers sensed a lack of excitement in the air as Saratoga opened its doors for the start of its 141st season. It may have been the high humidity and subsequent rain or the realization that better racing was ahead on the weekend that dragged people down. But the July and September days of the meet are never as enthusiastically received as the August days and July 29 seemed to underscore that. Regardless, let it never be said that glee is a requirement for gambling. Before the action stopped, horseplayers stuffed beaucoup moolah through the pari-mutuels, topping last year's storm-plagued opener by 30%. All-source handle jumped 25%, causing track officials to experience delirium. It took an electrifying victory by Gold Trippi in the $73,500 James Marvin Stakes, run as the third of 10 races, to wake people up. Riley Tucker was bet down to 4-5 and took the lead as though he deserved it. But when the field hit the stretch and a resurgent Pyro, making his first start in nine months, slipped through the pack, started to open up and appeared a sure winner, Gold Trippi finished stronger and caught him. In the fourth race, Alexandros broke down and had to be euthanized. Bill Mott chose the fifth race to celebrate his 56th birthday. The Hall of Fame trainer kept tradition alive by meeting a front-running colt by the ill-suited name of Come From Behind in the winner's circle. Later, Trappe Shot, an $850,000 colt bred by Hobeau Farm, finished fifth in the seventh. Watch for this one next out. Highlight of the day, of course, was Hot Dixie Chick's six and a quarter length victory in the grade III, $111,000 Schuylerville Stakes. Jockey Cornelio Velasquez permitted the daughter of Dixie Union, owned by the Grace Stables of Barbara Banke, to run one back of the pace until the fillies came out of the turn and then showed the crowd of 25,444 what his mount was made of. Hot Dixie Chick set the five furlong record at Churchill Downs in her second career start. Her two-for-two resume coming into the Schuylerville was achieved running so fast that the competition couldn't catch her. This time around, she did the catching. Trainer Steve Asmussen thinks that's a good sign. Today might begin slowly also. The first race is a $70,000 steeplechase stakes and the next four are for claiming horses. The best of these beasts can be purchased for a measly $35,000, the least for just $20,000. But there are big fields again - good for betting, and a contentious grade II, $150,000 Sanford Stakes that has lured nine speedy juveniles postward.